Hoje é dia de Mailbox Surprise! Como prometido na semana passada, a Trine (e a sua filha Wilma) vieram fazer-me uma visita! E trouxe consigo não uma mas três criações cheias de estilo. Mas outra coisa não seria de esperar da criadora de Groovy baby... and mama! As promised, Trine and her adorable daughter Wilma are visiting DoGuincho today! And they brought from Denmark not one but three stylish creations. I am as impressed as I always am when I visit Groovy baby... and mama and delight myself with the funky clothes Trine makes for her family! Thank you so much for inviting me, Marte and Marta. And let me start by saying - I won!!! As in, I won the best mailbox friend - ever. Thank you so much for the gorgeous fabric and ditto zippers, Yifarn - spot on! I simply love it. Without further ado I present to you my creations - yup, plural - 'cause I managed to squeeze 3 items from this fabric. 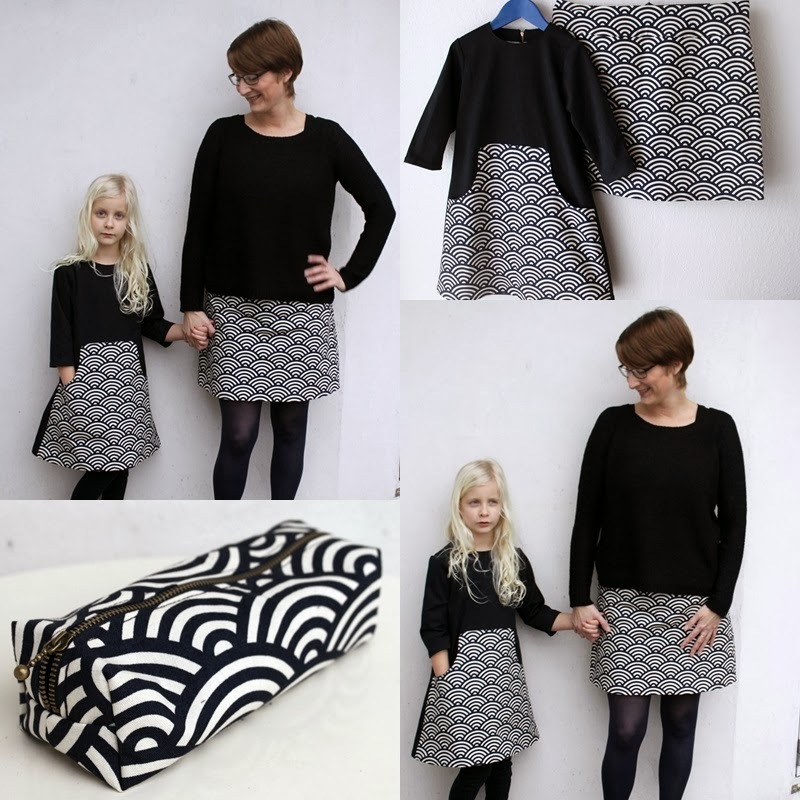 A skirt for yours truly, a Louisa Dress for Wilma and a makeup pouch for me Luna. 3 happy girls with one fabric! It was a puzzle but I succeeded in matching up the fabric for Wilma's dress. Hopefully you agree when I say that you can't see the center seam front on the pocket part? If you can just lie to humor me! My skirt is just a simple low waist version with side zipper. If you study the photos of the pouch you can see the gorgeous zippers Yifarn send me along with the fabric. I've used the other one for Wilma's dress. Thank you so much all of you great, creative women - it's been a pleasure! E adorei o vestido da Wilma. This one is really superb! 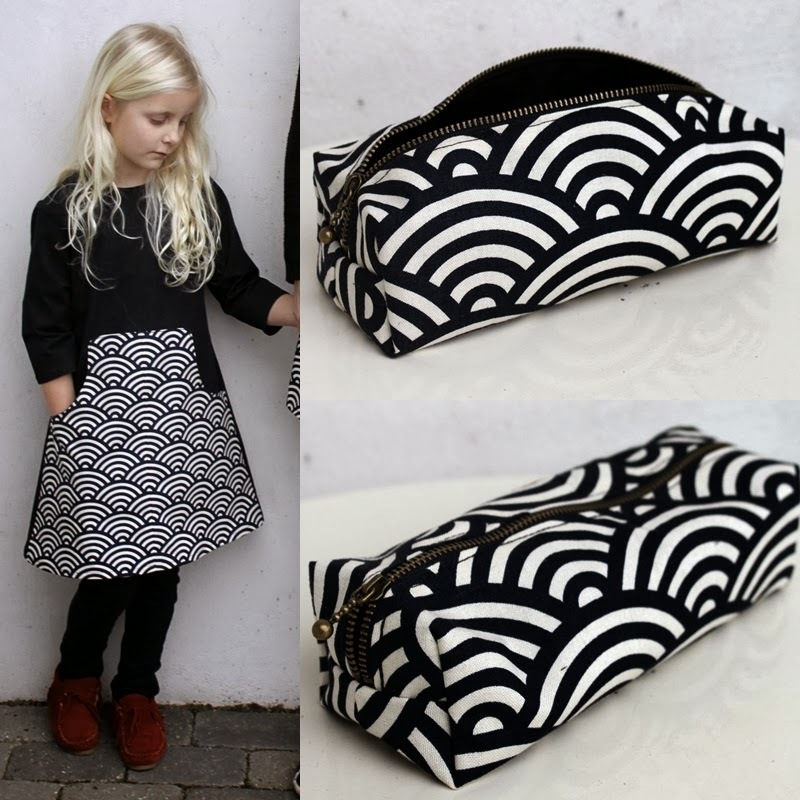 Love the louisa, love the skirt, love the pouch! I loved all the pieces. The fabric is indeed gorgeous! It's incredible the way Trine managed to turn this wonderful fabric into so many different creations, isn't it? Thank you Trine for being part of Mailbox Surprise Series!